In today’s competitive world green roofs have become an increasingly important option for industrial, commercial and residential clients for turning dead and dull places into green, living spaces. Tetra Construction roofing services can help to provide efficient solution to green roof construction and green roof maintenance services. Green roofs provide many psychological and physiological health benefits and contributing in sustainable environment by reducing urban heat and decreasing the carbon foot prints of building. Green roofs are not only providing aesthetic pleasure, water storm management and water absorption but also provide increased insulation, climate cooling, and habitat for wild life. The complete top green roofs also cover the waterproofing and Insulation needs as in a normal flat roof. Go green with eco-friendly roofing solutions and get advice on cool roofs, solar electric systems and vegetative living roofs. We work on all aspects green roofing system from installation, maintenance and repair work to ensure maximum durability and waterproofing. 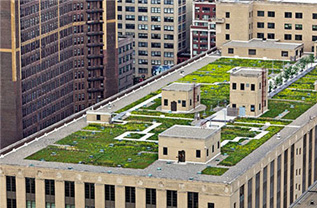 We are full services Green Roofing Contractors, our timely, affordable and competent service, in five Boroughs of New York, enables us to ensure clients satisfaction with sense of urgency and dedication. Interested in Custom Green Roof Installation, Let us know and Get Free Estimate of you green roof project from Tetra Construction.